How Do Box Kites Fly? It's a sunny day, the sky is blue, and a warm summer breeze stirs the air--a perfect day to get out and fly a kite! Kites are not a new invention, by any means: they have been crafted and flown for thousands of years, according to NASA, popular among many different cultures for both leisure and functional purposes. The box kite in particular is a popular type of kite that can be enjoyed for fun, and can also teach a little science. So you've gotten the box kite into the air, and are watching its colorful fabric rise into the blue at the end of the string. But what makes the box kite fly? The answer lies in its construction, and in two simple concepts of aerodynamics. The science behind the flight of the box kite is fairly simple to comprehend, and an understanding of it brings a new appreciation of the simple elegance of this truly unique kite. According to NASA, box kites are able to fly due to the particular way they are constructed. These kites are simple to construct, usually made from thin sticks and string, covered with silk or similar lightweight, synthetic materials. Box kites are typified by NASA as "heavier than air" craft, so the sticks and material used must be as light as possible for the box kite to take to the air. When a box kite is made, a box-like skeleton is assembled out of light balsa or bamboo sticks, and the two ends of the "box" are wrapped in fabric, usually brightly colored, leaving both ends and middle of the box open to the air. The string of a box kite is attached to something called a "bridle line," which is attached to both ends of the kite in something like a triangle. This line creates the point at which the box kite pivots in flight, and the "control line" leads down from the kite to the string roll in your hand. The box kite is constructed and ready to fly. But now that we know how its lightweight construction helps the box kite fly, what about the laws of aerodynamics? The box kite's design utilizes two simple principles of aerodynamics to soar through the sky-- lift and drag. These principles also govern the way other kites, and even airplanes, are able to maintain altitude in the air. However, the box kite's method is slightly different from the lift provided by wings or gliders. 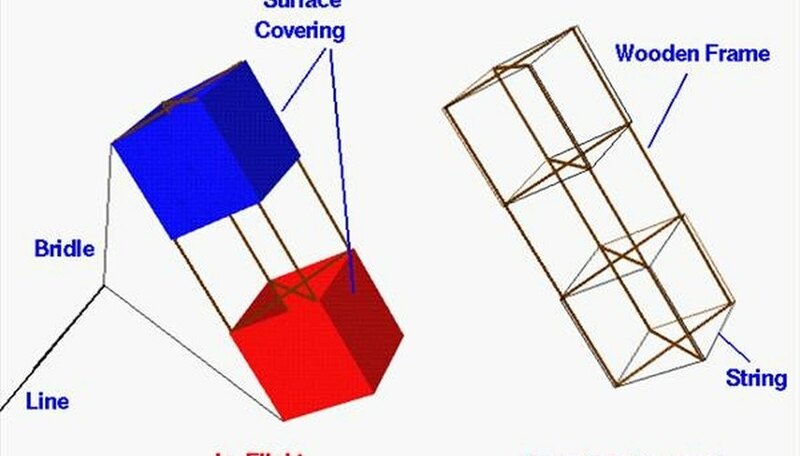 Lift is one aerodynamic force that acts on the box kite's surface. When a breeze hits the box kite, lift is created as the air rushes through the fabric-covered skeleton, and the kite takes off. However, without the other force that acts upon the kite--drag--the kite would simply sail off out of sight! Drag is dependent on the velocity--or direction and speed--of the wind hitting the box kite. You can feel this force directly through the string anchoring the kite to your hand. NASA says that the concepts behind the box kite and other kites were applied by the Wright Brothers in designing the first successful airplane. So, the next time you fly a box kite, remember that you're literally guiding the foundation of modern aviation in your hand. Why Does a Kite Have a Tail? How Does the Shape & Size of the Fins Affect the Flight of a Rocket?